The origins of the production of cold cuts in Calabria date back probably to the time of the Greek colonization of the Ionian coasts. The oldest written record of the southern people in power is due to Marco Terenzio Varrone, the Roman writer of the first century BC He wrote of “a ground meat, stuffed into a gut,” which the Roman soldiers learned to produce from the southern populations. Another Roman, Marcus Marco Gavio Apicio, in his famous De re coquinaria, confirmed that the preparation of cold cuts required salt and pepper. The first certain documentation concerning the tradition of pork processing date back to 1600, a period in which it was published Della Calabria Illustrata. The French decade, 1806-1815, dates back to the Statistica Murattiana. Among the illustrious witnesses of the goodness of Calabrian cold cuts are Giacomo Casanova, who tells of having lunch at the dining hall of the Bishop Cavalcanti Francescantonio in Calabria. Here he tasted with particular enjoyment the cold cuts of Calabria, who judged the best he had ever eaten. 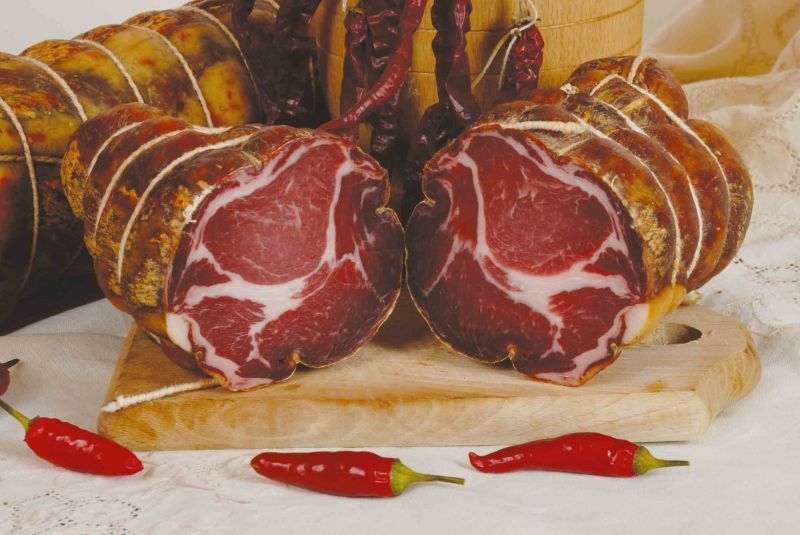 Capocollo Calabria DOP has a cylindrical shape, wrapped in natural film, hand-tied in the enveloping shape with natural twine. It has a pink or red color more or less intense and a delicate flavor that is refined with age.